New works by Jan Wawrzyniak (b. 1971, Leipzig) will be on view at Galerie m Bochum from 17 January to 5 April 2014. 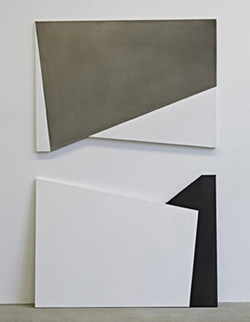 Charcoal and canvas are the basic elements out of which the Berlin-based artist conjures nonrepresentational pictorial constructs consisting of white, gray and black lines and planes. The images draw the viewer in, inducing him to read spatial structures into the flat forms as intuition interacts with reason. 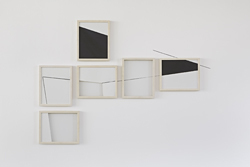 The recent works expand Wawrzyniak’s formal repertoire to include non-rectangular canvases, multipart installations and new materials: in his Broken Drawings, for example, the artist uses glazed wooden frames and paper, letting the drawings run across the various levels and onto the surrounding wall. He also cuts selected canvas fragments out of previously discarded pictures and then mounts them directly on the wall as Lost Drawings, which sometimes jut out into the room. Wawrzyniak’s works cannot be readily classified under any specific artistic genre; nor do the lines, shapes and planes come together to form bodies or coherent spaces. Instead, painterly, graphic and lately also spatial, sculptural qualities meld to create pictorial objects that offer a rich visual experience. At the nucleus of this show are two monumental triptychs made of polygonal, asymmetrical canvases. Diverse imagined spaces evolve from both the composition of planes on each individual canvas, as well as between the different picture elements in and beyond each work. A ceaseless perceptual process is set off in which planes tilt forward and deep spaces open up and close themselves off again. In Wawrzyniak’s Broken Drawings by contrast, the viewer is confronted with wooden frames, glass, lines and paper that are overlaid on multiple levels, some of them transparent — in this case the depth is therefore not only an illusion. Even so, the entirety of a work, which at first seems so clear-cut, continually eludes the gaze. No matter which element we choose to focus on, those on the other picture planes then drop out of view. The Broken Drawings moreover challenge in general the isolation and unity of the individual work of art, traditionally manifested in particular by its framing. Here, Wawrzyniak no longer conceives of the frame as a border marking off the work from the outside, but rather as a pictorial element that takes its place inside the work. The Broken Drawings thus deny us not only the spatial illusion of depth but also a clear boundary on the surface of the wall. This aspect of continuous oscillation and precarious instability is more than a mere formal sleight of hand. Wawrzyniak’s works tangibly demonstrate to what extent our perceptual faculties rely on stability and clarity. And this is what makes them so mesmerizing and haunting: the frustration of our longing for a stable and comprehensible world. In this sense, the works open the way not only for a contemplation of human perceptual mechanisms, but also for a reflection on our expectations, experiences and perplexity on all levels of life and society.